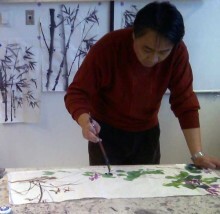 See your surroundings and express your feelings with Sumi painting taught by master visiting artist Yuming Zhu. Paint landscapes, vegetables, breads, flowers, and anything you like that you experience in your daily life in the expressive Sumi style. Energetic strokes and unique expression in composition will be emphasized along with fusion of western and eastern techniques. Composition – planning, feel, and arranging what you see – will be emphasized throughout the workshop. Students will learn how to accept mistakes, embrace changes and happy accidents, and adjust compositions to fully express themselves. On the first day, participants will use sumi ink and big brushes to paint black and white images on Sprinkle Gold paper. On the second day, the group will paint the PoMo style of landscape, creating representational images on Yun-Long Paper and on Long Fiber absorbent paper to experience ink flow and mingle revolving natural images. Since this is the Year of the Dog, we will also work on painting simplified style of a dog and writing Chinese characters of Dog and Blessing. Please see supply list including recommendations for repeat students. Please bring a bag lunch. Yuming Zhu lives and works in Seattle, WA. Originally from Shanghai, China, he began studying painting under master artists at age ten. He teaches sumi painting and calligraphy in colleges and art centers, as well as through regional and national sumi organizations. 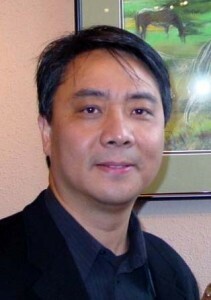 His work has been extensively collected and exhibited, particularly in the Pacific Northwest. More information can be found on his website: www.yumingfineart.com. Yuming teaches an annual spring masters class for BTAC.